Joe Pass – Back in June this year we blogged about a great recording featuring Canadian jazz guitarist Ed Bickert, playing beautifully well (as always) in a duo setting with trombonist Rob McConnell. This got us thinking about other great jazz duos which feature a guitarist. 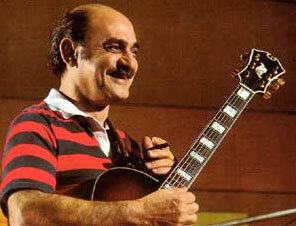 It didn’t take us long to come up with the name of the great jazz guitarist Joe Pass. Not only was he a master of solo guitar playing, a wonderful accompanist and a great single-line soloist, he was also quite incredible in a duo setting. One of his most famous collaborations was with the acoustic jazz bassist Niels-Henning Ørsted Pedersen. Their seemingly telepathic musical communication is quite incredible to listen to and at times it is easy to forget that the vast majority of what they were playing was improvised right on the bandstand, with little or no pre-planning. Duo jazz playing really doesn’t get much better than this. Ive been a blues, pop, rock and classical player for nearly 40 years but always enjoyed listening to jazz guitar. I heard about Joe Pass a long time ago when I borrowed a Joe Pass method book from Bradford Library in the days when there was no internet! What! I nicked a few chords but that was about it. Now I am just in awe of him – I watch him all the time on youtube and have started to have a go at copying him – but I cant! But its great fun finding out what he does. It has opened up a whole new world of music for me. Love the guitars you have for sale here.